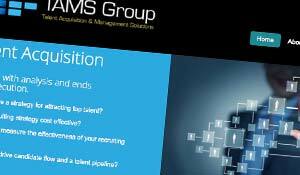 In 2013 Edwards Communications had the privilege of developing the branding of TAMS Group – an HR outsource company to form from the merging of THRD (The Human Resource Dept.) and Strategic Talent Consulting. Branding defines who the company is… and intends to be. As is typical in branding campaigns, EdwardsCom starts with the Vision and Mission Statement, as these are the true values and goals of the company and lay the groundwork for all that is to come. From there, we developed the logo. We did some market testing before deciding on the final with the final decision coming from CEO Dan Simovic. The business cards followed after that, while simultaneously working on the website and corporate brochure. We are currently working on the design and implementation of four separate email campaigns that target their four individual markets. Each are designed to take them to certain aspects of the site for calls to action.